It is not every day that the opening words of a scholarly book can move me to tears. I am not sure why I was choked up reading a few pages out loud to Beth this morning; perhaps it was knowing that today was the Feast Day of the Slaughter of the Innocents, the churches commemoration of the politically-inspired genocide that follows on the heels of the Nativity story. Or perhaps I was thinking of the great sadness of the bombing of Gaza during this holy time of year. Or, perhaps, it is just the wonderful knowledge that God’s Spirit can convict and change people; how glorious to know that God is alive and well, working to conform His people to Christ Jesus. The book I was reading from is an example of just that. 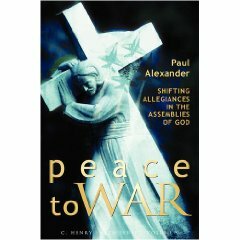 Peace to War: Shifting Allegiances in the Assemblies of God by Paul Alexander (Cascadia; $26.95) was just released and the forward tells of the author’s journey from tongue-speaking, pro-war, right-wing, Pentecostal ditto-head to tongue-speaking, Spirit-filled follower of the way of Jesus’ nonviolence who has embraced Biblical pacifism. Alexander’s world was rocked—-his faith destroyed, his life murdered, as he colorfully puts it—when he discovered that (get this!) in the first decades of the Assembly of God denomination they were mostly pacifist. Who knew? When one thinks of the historic peace churches, one thinks of the Anabaptists such as Mennonites, Quakers, and various sorts of Brethren. When one thinks of contemporary activist peace-making churches, that is, those who are engaged in anti-militarism, pro-justice, advocacy for peace, even if not exactly pacifist, one thinks of the mainline churches like the Presbyterians Church (USA), United Methodists, UCCs, Episcopalians, American Baptists, or Roman Catholics. There are very few folks who are outspoken about peace & justice issues from the holiness or Pentecostal denominations. More often, they support Zionist militarism, seem nearly pro-war and presume a civil religion that is very nationalistic, shaped by an ethos that could easily be considered hawkish. And so, this book is shocking. Shocking that we never knew this bit of Christian history. Alexander, himself a fourth generation Pentecostal (yes, his relatives were around during the famed Azuza Street revival) and a grad of an AG college and AG seminary, never knew. This book is the first major work to document the consensus that war was worldly and followers of Christ, empowered by an experience of the Holy Ghost, can live, quite literally, “not by power, not by might, but by my Spirit” as the famous Zechariah text has it. (I have long preached, by the way, that Zechariah 4:6 is set in the context of the nations and has political implications that are mostly overlooked by those who quote the verse or sing the songs inspired by it as if it is verse about personal power for individual piety.) Alexander has had his faith transformed, and I am eager to follow his journey in this stunning new work. It is a book that Regent famed Pentecostal scholar Amos Yong calls “gripping” and “prophetic” That says a lot. A major concern of the book, as the title suggests, is how the Assembly of God denomination, and the fellow-traveling Pentecostals generally, so quickly lost their sense of Christ-centered nonviolence. How did a denomination who, empowered by the fruit and gifts of the Spirit, with an ethos of counter-cultural holiness, with a clear consensus in favor of conscientious objection, lose that vision in a matter of a few decades? It seems that Alexander makes an important argument in answering that, something to the effect that a doctrine which was mostly based on a simplistic “turn the other cheek like Jesus did ” was not sustainable, and without a nuanced view of institutions, the State, power, and such, cultural accommodation crept in and war fighting became justified and then accepted (and now often glorified) as the charismatic and Pentecostal tradition, when it is socially engaged at all, is now often yoked to the far end of the religious right. Maybe that is why I was so touched by the first pages of this academic work. I long for examples of folk who take faith seriously, rooted within their tradition, but open-minded to explore, and change, when they come to new insights. Ecumenical and open in our reading and learning, and radical and faithful in our application and formation….ahh, isn’t that what this whole book-selling this about? It does this old heart good to hear of a guy who read and studied, changed and is now a different man. The author, by the way, now heads up a network linking those interested in charismatic renewal and peacemaking. See his Pentecostals and Charismatics for Peace and Justice. This means a great deal to me, but, more, just the example of a fellow honest enough to change so much based on his study should give us hope. As we think of the horrors of our world—-Israeli bombs flying the very day the Zechariah text is being read at Synagogues from their Hebrew lectionary–– perhaps we should, as Psalm 34:14 commends, “seek peace and pursue it.” Maybe we can hope that Pentecostals, even, can add their empowered voices not just for instant healing and promises of financial prosperity–distortions that the best Pentecostals reject—but for a Holy-Spirit driven whole-life witness that lifts up the foolishness of the reign of the Risen Christ, even against the ideologies of militarism and war. Peace to War is not just for descendants of Azuza Street, not just for Mennonites. It may be helpful for us all. Wow, Byron … this looks like a great book. I’ll have to check it out soon! Many of the holiness churches began with a peace position, but lost it over time. I (who am now BIC) wasn’t aware of that until doing some research a year or two ago in seminary. This is something I think about a lot, and this definitely looks like a book I’m going to want to read. Thanks! The Quakers, Mennnonites and Brethren do not truly count as peace churches anymore. They have given up their heritage of peace, except in a few circumstances. The so-called “Christian” Friends Churches hire non-pacifist pastors, and since WW2, about 70% have gone to war. For the Mennonites, it is about 40%, with many Brethren right behind that. The Peace Churche are a joke. They no loner follow Jesus and are turning to the extreme right, some of it caused by Christian Zionism. I taught at a small Pentecostal Bible College once, and my life was threatened by a student because I was a pacifist.